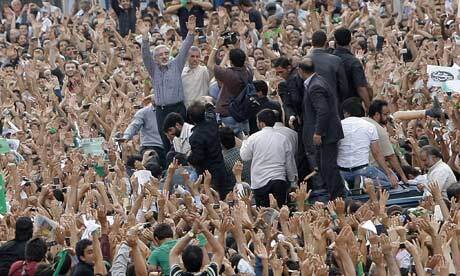 Mir Hossein Mousavi, in striped shirt, at rally June 15, 2009, Tehran. Mousavi supporters march and rally June 16th, Tehran. Today, Tuesday, June 16th, supporters of the reform candidate Mir Hossein Mousavi, staged another massive rally in Tehran, the capital. The two rallies face off against each other - the Unity rally called by the government in support of Ahmadineja and the rally in support of reformist Mousavi. north Tehran, June 16. Mousavi’s Facebook reports that it was peaceful and there was no aggression from the police. Mousavi had actually warned his supporters not to turn out today for fear of violence – as the government staged another of its “Unity” rallies at about the same time. The potential for clashes was very high. Today was the fourth day of protests since the election. The rally today was supposed to be more massive than yesterday’s. There are very few images from today’s rally as the crackdown on journalists and media reporters has been very intense, and apparently effective. 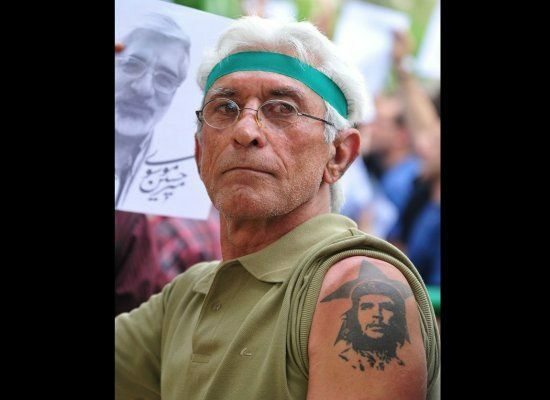 Stick this in your pipe and smoke it, all you right-wing pundits who now back the Iranian reformists - here is an older Iranian with a Che tat. Wow. I guess Che supporters are everywhere. Also, Mousavi had called for a workers’ general strike for today, Tuesday, and I saw a report that said it was working as most offices in downtown Tehran were empty. Also today, doctors and nurses still in the lab coats and smocks staged a rally to protest the 8 dead and 39 wounded that they had seen the night before. Some were in obvious support of Mousavi, as well. This is in stark contrast to last night and yesterday’s huge gathering. Yesterday’s outpouring had estimates from 200,000 to 1.5 million people. Participants reported that it was a silent march, no chants or slogans, until a conflict erupted in one corner of the huge square when a building housing an armed militia, the Basij, connected to the government was set on fire. Then men with rifles started shooting into the air and then into the crowd. Reports of 7 killed and many wounded have been confirmed. One nurse said an eighth person was also killed. After the shootings, pandemonium broke out, and there were reports of fighting between demonstrators and the police and the Basij. There are a number of reports, some unconfirmed, that show a definite fissure in the ruling clerics. 16 senior members of the Iranian Revolutionary Guard were arrested and transferred as they supposedly were conferrring with police and army units. If this is true, this could mean the armed forces do not necessarily support Ahmadinejad – the current president. One news report has a high-level cleric announcing that the clerics no longer support Ahmadinejad, who left Iran for an international conference – a conference his office first said he was not attending. At the conference, he had no mention of the worst riots and demonstrations in his country since 1979. There are also sad reports that up to 7 students were killed in a raid at an university in the southern city of Shivaz. In a possible ploy to gain time, the ruling Guardian Council announced that it would do a partial recount of ballots in the obvious fraudulent election, held last Friday. 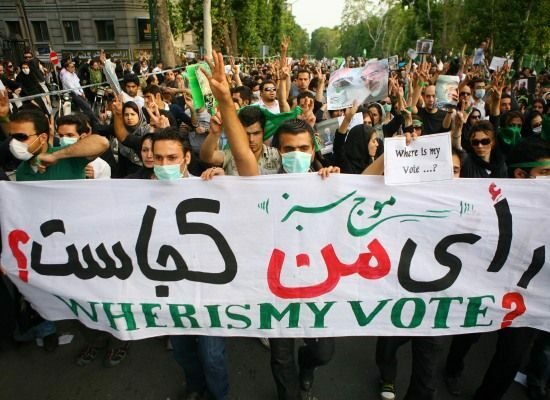 Despite an 80% voter turn-out, where paper ballots were used, the government had announced the winner – Ahmadinejad – in only a matter of hours, a logistical impossibility. Mousavi has said he rejects a recount and wants a full new vote. Who would do the recount anyway, the same people who did the original fraudulent count? Twitter, youtube, and other internet resources have proven to be invaluable, as the traditional video media has utterly failed to adequately report on the quickly unfolding events in this country, in contrast to CNN’s coverage of the bombings of Baghdad in Iraq during the first Gulf War. There is a virtual cyberwar going on, with the government hacking and blocking twitter and journalists, and grassroot hackers hacking Iranian government websites. See this. However, the government in Iran has taken big steps in trying to sabotage twitter and other internet sources, plus all foreign media have been nearly totally blocked from doing any reporting, with many reporters having their visas grabbed and being ordered out of the country. Meanwhile, police and militia are making arrests of students and others perceived to have been involved in the demonstrations. People are receiving random twitter messages saying that the police knew they were at a rally and they will be taken care of. Grand Ayatollah Montazeri, one of the leaders of the 1979 Islamic Revolution who fell out of favor with Khamenei over disagreements on civil and women’s rights, has “issued a statement supporting peaceful protests to ‘claim rights,’ condemned the violence, and called the Iranian presidential election results into question.” Translated version here. Another demonstration has been called for tomorrow. The fact that right-wing pundits in America have come out in support of the demonstrators does not diminish their righteousness, and definitely should not give progressives here a pause in our step. America has a long and sordid tale of involvment in Iranian politics, especially the early 1950s overthrow of a democratically-elected leader by our CIA. President Obama has been cautious in his public statements, as he must be, as we don’t want America to be an issue in the streets of Tehran. Watch the internet as this very important and historical moment in Iran progresses. All eyes on Iran, even from Ocean Beach. For more information, check into these links: go here, here, and here. This election and the post-election protests is by far the greatest challenge the Islamic Republic of Iran has faced since its inception in 1979. Neither the downfall of President Banisadr in June 1981 nor the election of Mohammad Khatami to presidency in June 1997 matches in size and intensity the events of the past few weeks. 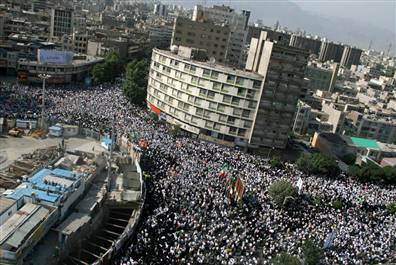 Even though the outcome is uncertain, the ongoing protests reflect a remarkable phenomenon: the rise of a new middle class whose demands stand in contrast to the radicalism of the incumbent President Ahmadinejad and the core conservative values of the clerical elite, which no doubt has the backing of a religiously conservative sector of the population. Nevertheless, this new middle class, a product of the Islamic Revolution that supports Mir Hussein Moussavi and the reformist cleric Mehdi Karroubi, the two moderate opponents of Mr. Ahmadinejad, is a force to be reckoned with. This middle class has a different vision for the Iranian society and state. It is much larger in size and younger in age, politically more engaged and less timid. Who knows what sort of president Mousavi would have been, or could yet be? He is an entirely different kind of animal from reformist politicians of the past; he is identified not with students and intellectuals but with the hardscrabble war years and the defense of the poor. But as one analyst explained to me, the problem he faces is that he is perhaps the only person on the Iranian political scene whose public stature is equal to Khamenei’s. He was a favorite son of Ayatollah Ruhollah Khomeini in the nineteen-eighties. Many Khomeinists in the power structure respect and support him; within the Revolutionary Guards, as well as within the upper clergy, he has a constituency. Traditional, religious people are among his supporters, too. On the morning of June 12th, he may have been the uncharismatic compromise candidate for the anyone-but-Ahmadinejad crowd. But to other voters he was then, and he has increasingly become, something else: the vehicle both for the memory of the utopia that never came, and for the hopes of a younger generation that imagines he shares its vision of the future. Photos. The AP notes that Iran’s new rules “prevent media outlets, including The Associated Press, from sending independent photos or video of street protests or rallies.” It’s a major problem — but not insurmountable. Reader Babak emailed over photos from today’s rally in Tehran, and we’ve posted some of them in the slideshow on our homepage. According to Abbas Sadeghian, author of Sword and Seizure; Mohammed’s epilepsy and the creation of Islam, born in Iran, but living in the US since 1975. “This will be Iran’s third revolution. The first was in 1906, when the dynastic Shahs lost control and the country was changed to a constitutional monarchy, like England. The Shah had no power or responsibility, like the Queen of England. But during the second world war, Mohammed Reza Shah Pahlevi rose to power, installed by the US. When Iran nationalized oil drilling done by US companies, the CIA engineered a coup in 1953 that replaced the legitimate prime minister Mohammed Mossadegh with the US-installed Shah. The second revolution was started in 1978 and ended in the removal of the US installed and supported Shah. Ayatollah Khomenei took over as ruler. He killed off many of the people who had started the revolution, including some of his closest supporters because he had originally promised, when living in exile in Paris, that Iran would be a democratic, parliamentary country, that the job of clergy would be a non-ruling supervisory one. Once in power, Khomenei hijacked the revolution and created a sharia-based theocracy. This third revolution appears to now be under way. A couple of years ago we all hated the government, but couldn’t do anything about it. To fight the government, there are three possible ways to revolt. or, you have the political party which will do it. In Iran, the supreme leader controlled the Mosques and the army and there were no free, legitimateparties, no real chance for the people to vote for an alternative, no chance to organize and start an uprising. The parties were a sham that government put together. Because the government ended up with a split over this election, the people now have a leader as well as their organization . If Rick Nadeau was still alive, he would be having a ball watching the hour-by-hour developments in Iran, as that was one of his special subjects, and it was a topic he was discussing as a panelist the night I met him 30 years ago.